The Créteil International Women’s Film Festival, which was held from March 22 to 31 honored veteran filmmakers and actresses who have attended previous festivals such as Margareta Von Trotta, Suzanne Osten, Mira Nair, Ulrike Ottinger, Agnes Varda, Carmen Maura, Maria Schneider and Anna Karina. The guest of honor this year was Jeanne Balifor, an actress unknown outside of Europe who selects films that are noteworthy for their extraordinary themes. L´Age d´Ellen (Germany 2009), (The Age of Ellen) by the German director Pira Marais was screened for the occasion on Day 2 about a flight attendant (Jeanne Balifor) who decides to abandon her career after an incident in Africa when a leopard on the landing field is sedated by an animal rights activist. Youth from the Créteil high schools and university are involved in the festival, documenting the festival on film teams, and the government supports the festival. During the year, the festival creates video workshops for them with selected themes and their films are screened in the Créteil Prefecture. The new “Minister of Women”, Nayat Valaud-Belkacem in François Hollandes cabinet, visited the festival on Day 3 and proclaimed how important the Créteil event was. “Even the Lumière Brothers had a sister”, she declared. 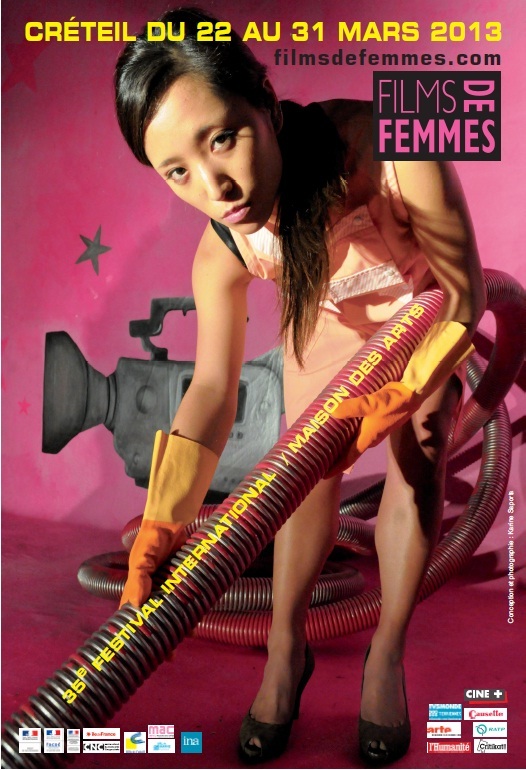 In the festival catalogue, she was generous in supplying ample statistics defying the myth equality has been reached by women in France: “Five percent of classical concerts are directed by women; 90% of the national dramatic theatres are directed by men; 4% of operas are directed by women, and 13% of the technicians in cultural arena are women. For the world of cinema, it is the same”, wrote Valaud-Belkacem. Créteil nevertheless devotes itself to “the privileged exhibition of film directors around the world; it has become over time the only professional event on a major international auteur cinema long discriminated against and poorly dispersed”. It is a festival supported by both the Ministry of Culture in France, and the Creteil borough. Director Jackie Buet has been with the festival since 1979. 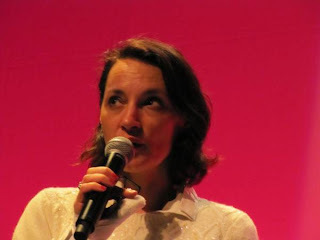 An invitation to the “L’Étrange” or Strange Film Festival in Paris featured two films by French filmmaker Angélique Bosio. The first was the world première of a documentary about a virtually unknown French designer– Fifi Chachnil. In Pretty en Rose (Pretty in Pink). Fifi is known for designing fashionable lingerie and attire for women and has worked with filmmakers such as the gay team of Pierre and Gilles. Bosio spend six years making the film which she also successfully crowdfunded in part. Bosio’s “Llik your Idols” from 2007 was also screened about the Cinema of Transgression movement of the 80’s coined by the American Nick Zedd, films which were inexpensively underground films created for shock value, often having a humorous effect. On the final evening of the festival was a special event called an ‘avant première’ of Margareta Von Trotta's biopic “Hannah Arendt”. Barbara Sukorow plays the German American political theorist. Arendt wrote several important books and also covered the trial of Eichmann as a reporter for the New Yorker. She was critical to how the trial was conducted and a large part of Von Trotta’s film treats this. 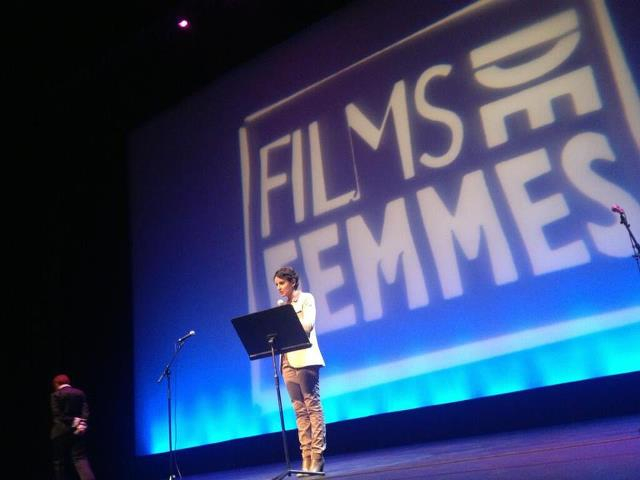 The international jury selected Hemel as the best feature film of Créteil festival this year. The story of a woman who is lost in a series of relationships and whose father soon becomes seriously interested in a new woman, which shakes Hemel’s foundation. The story of Chloe, a young Canadian obstetrician working in a makeshift clinic in a Palestinian refugee camp of the West Bank. Même un oiseau a besoin de son nid (Even a bird needs a nest) by Christine Chansou and Vincent Tritignant-Corneau (France, 2012). The film about one million Cambodians who have lost their homes to make way for commercial development, which elicited a massive protest led by women. Sac de Farine (Sack of Flour), Kadija Leclere Tunisia, 2012): the story about a young girl in Belgium whose father one day arrives at her school to take her to live in Morocco. She grows up learning how to sew and knit rather than study math science and art. One day everything changes. Créteil is clearly up to date, and defies the protocol of rival festivals with its special programming criteria. After 35 years the festival remains a maverick in the arena.